Harmar Vehicle Wiring Harness is recommended if using a Harmar Electric Mobility Carrier on more than one vehicle. It is approximately 23 feet in length and accommodates most vehicles. It is powered by the supplied electrical harness. Wiring harness has full-length leads that attach directly to the battery. 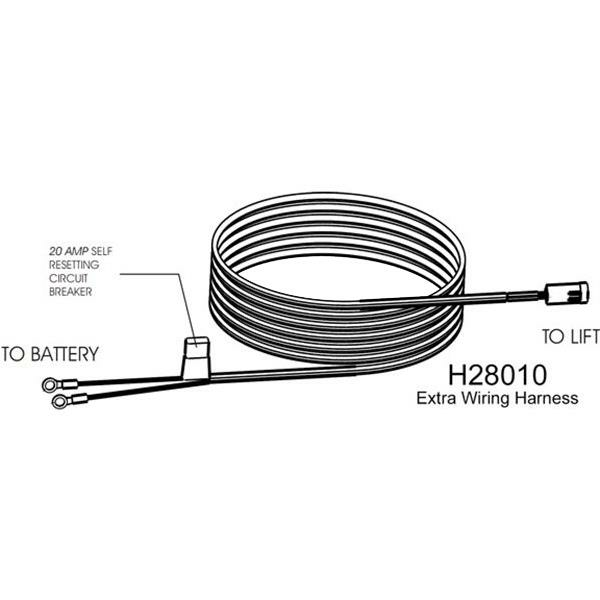 How to wire vehicle using Harmar Harness? Begin routing the wiring harness at the vehicle battery. Attach the black wire to the negative terminal on the battery. Do not attach the red wire until the end. Run the wiring harness under or when possible through the vehicle, back to the rear cargo area/trunk. Always locate the wiring where it cannot be snagged by road debris and away from the gas tank. Through the vehicle is best, gaining entry into the vehicle through the firewall. However, if you wish to run the harness under the vehicle, a hole will most likely need to be drilled to get the wire into the rear cargo area/trunk. If the harness is too long for the vehicle, coil the excess wire and secure it to the vehicle frame with supplied tie wraps. Once the harness is run into the vehicle, remove pin’s protective tubing. Inspect the pin’s retaining flanges. The may have become deformed while running them through the vehicle. These are critical to secure the pins inside the end connector. Adjust as needed. Flip open end connector’s hinged retainer. Yes, Harmar Vehicle Wiring Harness work with almost all Harmar lifts.